1. Bring an extra large pot of water to boil, cooking the manicotti as the box instructs, but keeping it on the al dente side so that the pasta is a bit chewy. Roll out a large sheet of aluminum foil. When done cooking, drain shells and transfer to the aluminum foil to prevent sticking. Leave them to cool. 2. Grease two large baking pans. Preheat oven to 400°F. 4. Chop the onion and garlic roughly and sauté them until they are golden. 5. While the onion and garlic are cooking, put the spinach, tofu, basil, nutritional yeast, lemon juice, and flax seed in a food processor. Turn on and let it process until a creamy, dip-like texture is achieved. 6. When the onion and garlic are done, add them to the food processor and pulse until they are fully incorporated. Add salt and black pepper to taste, and try not to eat all the filling before it goes in the manicotti! 7. Stuff the manicotti with the filling from the food processor using a small spoon and your fingers, if needed. Use your fingers to separate the openings of the manicotti if they are stuck together. If you are having trouble pushing the filling through, just fill one end and then flip it over, filling the opposite end. Use your hands to squeeze the filling throughout the pasta. 8. Pour one cup of marinara sauce into each baking pan and spread it around. 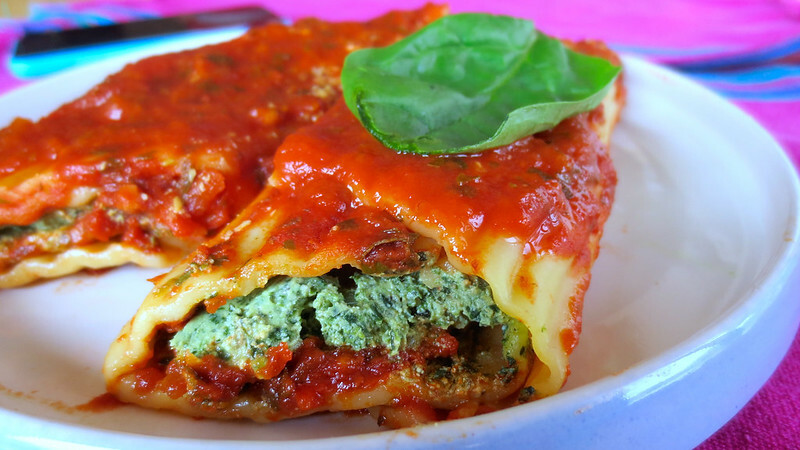 Place the manicotti snuggly side-by-side in the baking pans. Pour another 1 ¼ of marinara onto the manicotti. 9. Cover the baking pans with aluminum foil, poking a several holes in the foil. Bake for 25 minutes at 400°F. Serve immediately with extra tomato sauce and nutritional yeast on the side. Buon appetito! 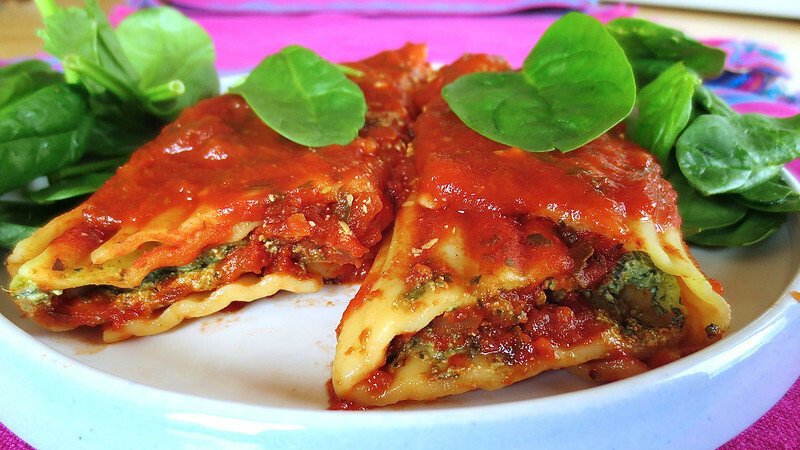 This entry was posted in entree, Uncategorized and tagged basil, dinner, entree, healthy, Italian, manicotti, pasta, plant-based, recipe, ricotta, spinach, tofu, tomato, vegan, vegetarian, veggie. Bookmark the permalink.